What skills do I need for the future? How can I achieve my personal goals? How can I thrive academically? Get future-proofed, get Your Digital Edge. What is Your Digital Edge? Get Your Digital Edge, use this website and follow our Facebook and Twitter accounts to get the latest news, events and network connections to help you get future-proofed. What are these ‘digital skills’ you speak of? Digital skills are capabilities that will give you information and communication technology (ICT) know-how. 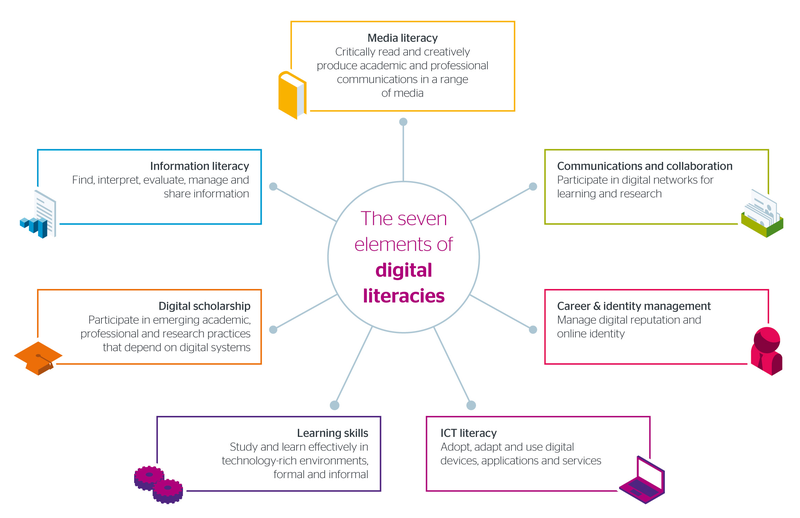 JISC (who champion the use of digital technologies in UK education and research) has identified seven key elements of digital literacy that will help students successfully navigate, participate, and create in online and technology spaces with confidence. Media literacy; Information literacy; Digital Scholarship; Learning skills; ICT literacy; Career & Identity management; and, Communications and collaboration make up the seven elements. Click here for a full size image of the seven key elements of digital literacy . Get rewarded as an Edinburgh Award Digital Ambassador, take on an internship, volunteer, build your edge with workshops, or have fun and run your own event. Get future-proofed, sign up here.